More info from Terry Canfield on ID protection. Just a reminder for everyone that prior to the Union meeting on Tuesday night there will be a presentation about protecting yourself against Identity Theft and providing yourself with a Family Legal Plan. Also, there is an update for those who have already taken advantage of PrePaid Legal's service. They have upgraded the real time credit monitoring to include all three credit repositories. We will have more information regarding this "Gold" service at the meeting as well. Click on the title above to view the e-book. 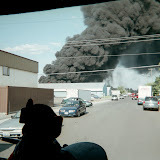 NARRATIVE: ON the morning of January 4, 2008 the City of Spokane's fire department responded 7 fire apparatus and 2 command personnel to a reported fire located at 713 East 9th Avenue. Neighbors reported fire showing on the entire backside of the home. Within 5 minutes of receiving the call, Engine 7 arrived on the scene under the command of Lt. Kelly Smith. Lt Smith reported that the home's occupant was safely out, and then, along with her crew advanced a hose line into the burning home to extinguish the fire. (During this initial attack fire was burning in the basement, first floor and attic areas.) Additional hose lines were used to extinguish fire in these areas. The main body of fire was extinguished inside 10 minutes. There were no injuries to the homeowner or his dog. The home owner was alerted to the fast spreading fire by the home's smoke detector. The home sustained heavy fire damage to the backside, basement and attic areas, but many of the interior furnishings were salvaged by the firefighters. DAMAGE EXTENT: Extensive structual damage to siding and attic areas. NARRATIVE: ON the afternoon of January 3, 2008 the City of Spokane fire department responded 6 fire apparatus and 2 command personnel to 38 West 32 nd Ave for a reported house fire. The first engine company reported a 1 St. Wood frame building with smoke and flame showing from the front window. A quick fire attack was made and the fire was knocked down with in minutes. A search was conducted and no one was found inside. Fire companies were on scene for three hours completing overhaul. The ceiling in the fire room was insulated with a large amount of sawdust which needed to be removed and taken outside. The fire was determined to be accidental, caused by a candle which ignited a Christmas tree. Two young boys' ages nine and ten were home at the time and were able to escape without injury. The fire Department would like to remind the public that any unattended open flame may become an ignition source to combustibles inside a home. PROBABLE CAUSE: Candle ignited a Christmas tree. DAMAGE EXTENT: Living room , smoke and heat throughout. At least that's the way it looks now. Until then, IAFF leadership will focus on efforts to educate voters on the real Rudy - an easy but putrid job. Hopefully they wear gloves and mask up, because once you start moving the stuff that Giuliani has buried himself in it's going to stink!